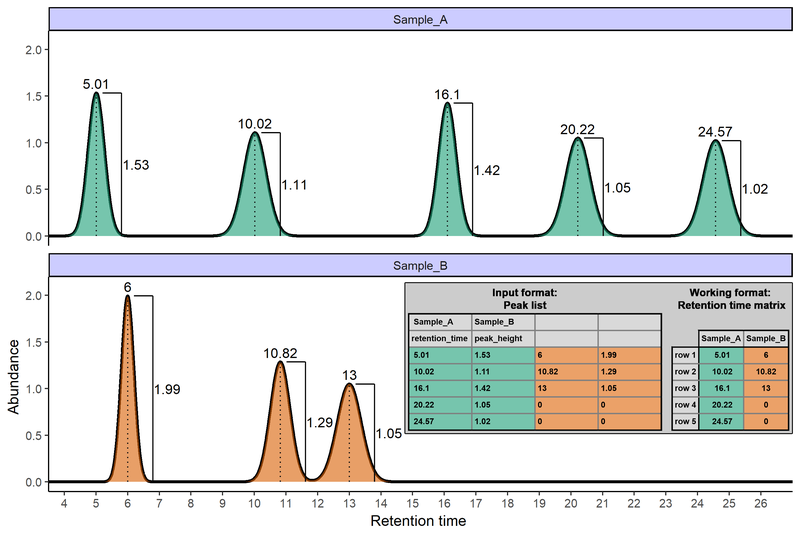 Aligns peak based on peak retention times and matches homologous peaks across samples. The underlying alignment procedure comprises three sequential steps. (1) Full alignment of samples by linear transformation of retention times to maximise similarity among homologous peaks (2) Partial alignment of peaks within a user-defined retention time window to cluster homologous peaks (3) Merging rows that are likely representing homologous substances (i.e. no sample shows peaks in both rows and the rows have similar retention time means). The algorithm is described in detail in Ottensmann et al., 2018 . GCalignR provides simple functions to align peak lists obtained from Gas Chromatography Flame Ionization Detectors (GC-FID) based on retention times and plots to evaluate the quality of the alignment. The package supports any other one-dimensional chromatograpy technique that enables the user to create a peak list with at least one column specifying retention times as illustrated below. The current release 1.0.1 is on CRAN. Also I´m happy to provide help if you can´t get it to work. Usually it is easy to solve small problems. However, in order to simplifiy this process please send a short describton of the problem along with the code you have been using as a script file (.R) together with a minimal example input file (.txt). Retention times are not rounded to two decimals anymore. Calculations still capture a precision of two decimals for purely computational reasons. Within the aligned results, retention times correspond to the input values. Linear adjustments are only used internally and are documented within the Logfile found in the output. The bioconductor package (MassSpecWavelet)[http://bioconductor.org/packages/MassSpecWavelet/] is added as in R solution for picking peaks from GC data.